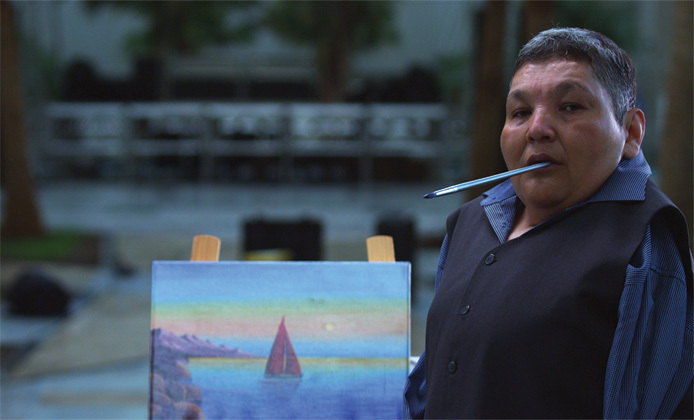 Karipbek Kuyukov is an artist and nuclear nonproliferation activist born without arms as a result of his parents exposure to radiation from nuclear weapons testing. He has devoted his life and art to making sure that no one else suffers the devastating effects of nuclear weapons testing. Karipbek uses his feet and mouth to capture on canvas the lives, culture and struggle he has known. He now devotes his work to painting the victims of nuclear testing and shares his works around the world. Forty-five years ago, Karipbek was born in a small village, just miles from where the Soviet Union conducted more than 450 nuclear weapons tests. Those tests exposed his parents to radiation and resulted in Karipbek being born without arms. Karipbek has overcome many obstacles to become an anti-nuclear weapons activist and renowned artist whose works have been shown around the world. Today, Karipbek often paints portraits of the victims of nuclear testing and, as honorary Ambassador to The ATOM Project, speaks out against nuclear weapons at conferences and events held in such places as the United Nations and the United States Congress. Kuyukov's moving speech presented at the August 29 international conference "From a Nuclear Test Ban to a Nuclear-Weapons-Free World" in Astana, Kazakhstan. My name is Karipbek Kuyukov. I was born in the village of Yegyndybulak, which is located 100 kilometres away from Semipalatinsk, the former Soviet Union's nuclear weapons test site. This land is sacred to me not only because it is my motherland but also because my forefathers were born here and lived there. For me, it is the most beautiful land in Kazakhstan. Years ago during the testing, my parents bore witness to those bright and vast mushroom clouds as they filled the sky. When I was born, I was born without arms, and it was a shock to my mother. Later, when I was old enough to understand, my father would tell me how he would drive along the steppe roads and would be stopped by military soldiers for trespassing on the forbidden territory - even though this was the shortest way from one place to another. My parents would climb on the hill to better see the nuclear mushrooms, although they were instructed to lie down on the ground and cover themselves. I remember the armoires shaking, and the rattling of dishes. I remember announcements on the radio, which would inform us about additional "peaceful nuclear explosions." My father was, of course, seriously worried about my future and very concerned about how I would live without arms. He brought me to Leningrad after learning about the Leningrad prosthetics institute where arm prosthetics were made. His hope was that I would be able to use them. I ended up studying in Leningrad and ultimately received my diploma, but I could never get used to the prosthetic arms. In addition to my school studies, I took up art. I have loved to draw since my early childhood. I do not know why, but my soul was striving toward creating something beautiful. I did this without arms, but with my feet, legs and mouth. I have become an artist, because an artist's soul cannot be diminished by a physical limitation. It is terrifying to realize that during the 40 years of tests on this sacred land, 470 nuclear explosions were conducted. The people who lived in Semipalatinsk at the time came out of their homes during the explosions to watch them. They didn't even know about the health threats and devastating consequences of the crimes being committed against them. People were basically treated as guinea pigs. Studies of both flora and fauna were conducted. At that time, we were told, radioactive substances do not affect flora. What a terrible lie! Overdoses of radiation cause human beings to suffer from cancer tumors, skin cancer and leukemia. These are death sentences! And, what's more, according to the experts, the consequences of radiation can affect from five to six generations of people. I have been to many countries where people have suffered from living under the shadow of nuclear tests. I have seen the tears falling from the eyes of mothers from Hiroshima and Nagasaki. I have participated in meetings and protests at the Nevada test site in the United States. I have worked with many friends, one (limited by) the consequences of the Chernobyl disaster. I have seen sick mothers, and children hidden by mothers uncomfortable with showing their children to other people. I have seen the effects of the great calamities that have damaged our planet. Everywhere I have been, people have known about Kazakhstan and about the unprecedented peace-making initiative of our head of state. Exactly 21 year ago, thanks to my President, the Semipalatinsk test site was closed. I am proud to live in Kazakhstan, the first country to abandon nuclear madness and to serve as a worthy example for other powers that continue the weapons race. Thanks to the decision made by President Nursultan Nazarbayev, I was encouraged to contribute towards and fight to rid the world of nuclear weapons. My main mission on this land is to do everything I can for people like me to be the last victims of nuclear tests. I will continue to call on all the mankind to preserve security on the planet until my heart stops. I do not want the repeat of these events at any place or time, anywhere on the planet. I am happy to live at a time when the voice of one person can be heard and supported by millions living in the most distant places of the Earth. Our voices can become one powerful voice! And all as one, we can call for the permanent end to nuclear weapons testing. We have a choice: to be passive and let the heads of states solve the issue or unite and defend our citizenship and human rights. Every single person has a right to decide the future they want for themselves, their families and their nation. I made my choice. I support The ATOM Project, whose aims, as outlined by our President, are to unite common efforts in the struggle against nuclear weapons tests. I became an honorary ambassador of the Project because I have a lot to say to the world, given that I personally know about the grief the dangerous weapons race brings. And I call on every single person to be active in building a future free from nuclear explosions: sign the online petition of The ATOM Project, make your mark in history. Our common goal is to protect mankind from the nuclear nightmare. Let us not repeat the mistakes of the past! I call on all the people in this hall to help stop the nuclear weapons testing around the world! Nuclear test sites must be closed! Let our sky be clean and our children be healthy! I do not have arms to hug all of you and to express my gratitude for participation in this conference, but I have a heart and it belongs to you! Let your families live in peace and serenity!